Here is the 2016 Minnesota Wild Qualifying Tournament in its entirety. For the first time in Ultimate NHL Playoff, the ’08-’09 Minnesota Wild will not be the franchises representative. The ’14-’15 Minnesota Wild came back from a 3-2 series deficit to clinch their berth in seven games. It was a low-scoring series and Game 1 was the highest-scoring game of the series as the ’14-’15 Wild won 4-2. The ’08-’09 Wild took a 2-1 lead early in the third period, but the ’14-’15 Wild scored three unanswered goals in the final 10 minutes of the game to win it. Nino Niederreiter scored twice while Jason Pominville tallied three assists. After Game 1, this series truly became a battle of the goaltenders. In Game 2, after each team scored a PP goal in the third period, Stephane Veilleux scored an OT winner for the ’08-’09 Wild about halfway through overtime to tie the series at one apiece. Niklas Backstrom stopped 52 of 53 shots against in the win. He then pitched a 38-save shutout in Game 3 as Eric Belanger scored the only goal in a 1-0 win. 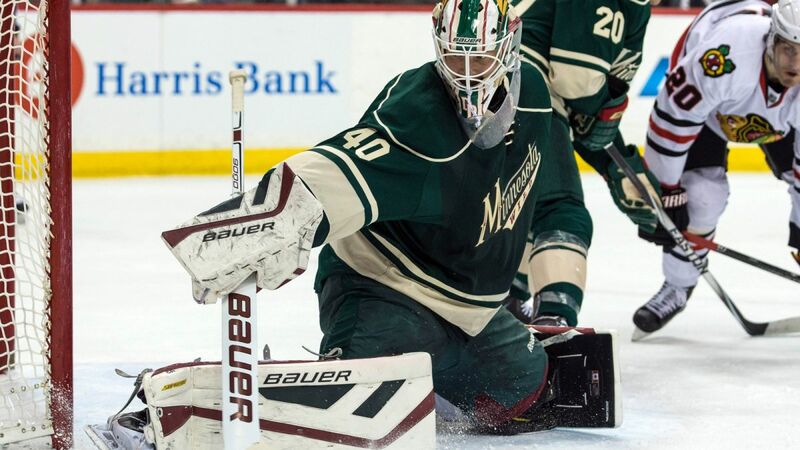 Devan Dubnyk responded by pitching a 29-save shutout in Game 4 for the ’14-’15 Wild in a 3-0 win. Zach Parise and Pominville both registered a goal and an assist. The ’08-’09 Wild got their second overtime win of the series with a 2-1 OT win in Game 5. It was Pierre-Marc Bouchard who potted the OT winner this time as Backstrom stopped 35 of 36 shots against. Now facing elimination, the ’14-’15 Wild took Game 6 by a score of 2-1 behind 32 saves from Dubnyk and two points from Parise. In Game 7, Mikko Koivu scored the lone goal of the game at the 6:54 mark of the second period as Dubnyk pitched a 37-save shutout. With the win, the ’14-’15 Wild clinched their first UNP berth and denied the ’08-’09 of the three-peat. This entry was posted in Qualifying Tournament, Ultimate NHL Playoff and tagged Devan Dubnyk, Eric Belanger, Jason Pominville, Mikko Koivu, Minnesota Wild, Niklas Backstrom, Nino Niederreiter, Pierre-Marc Bouchard, Qualifying Tournament, Stephane Veilleux, Ultimate NHL Playoff, Zach Parise. Bookmark the permalink.